Well, it turns out that Mr. Stoll was slightly off the mark (not to mention his bearish predictions on e-commerce and virtual communities). Electronic books have been a revelation, with the Kindle format being far and away the most popular. In fact, over 30% of books are now purchased and read electronically. And Kindle readers are diligent with providing reviews and ratings for the books that they consume (and of course the helpful prod at the end of each book doesn’t hurt). 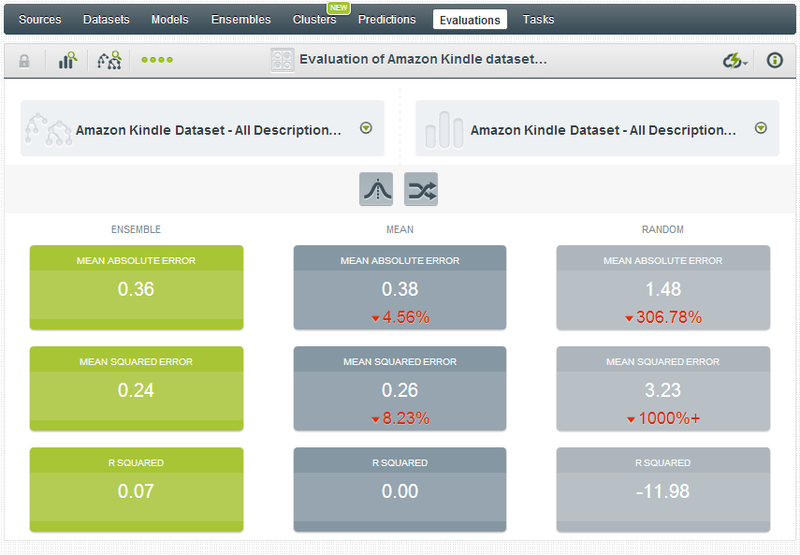 So that got us thinking: are there hidden factors in a Kindle book’s data that are impacting its rating? 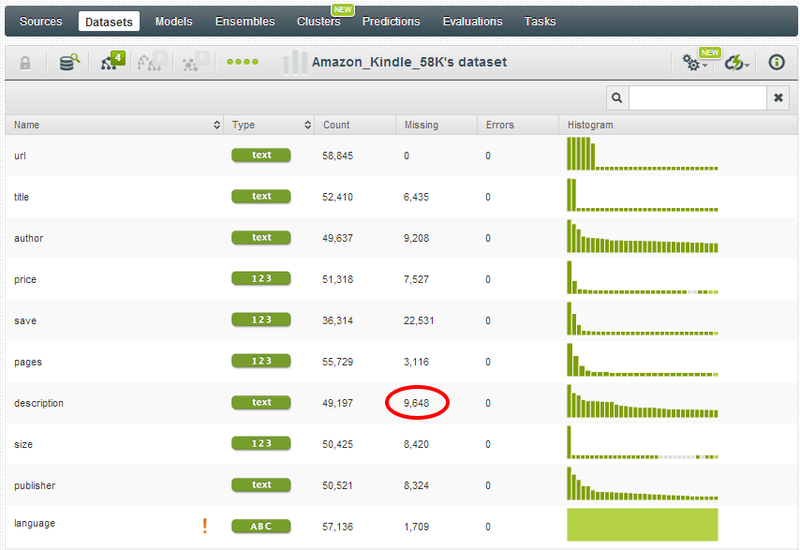 Luckily, import.io makes it easy to grab data for analysis, and we did exactly that: pulling down over 58,000 kindle reviews which we could quickly import into BigML for more detailed analysis. We uploaded over 58,000 Kindle reviews, capturing URL, title, author, price, save (whether or not the book was saved), pages, text description, size, publisher, language, text-to-speech enabled (y/n), x-ray enabled (y/n), lending enabled (y/n), number of reviews and stars (the rating). 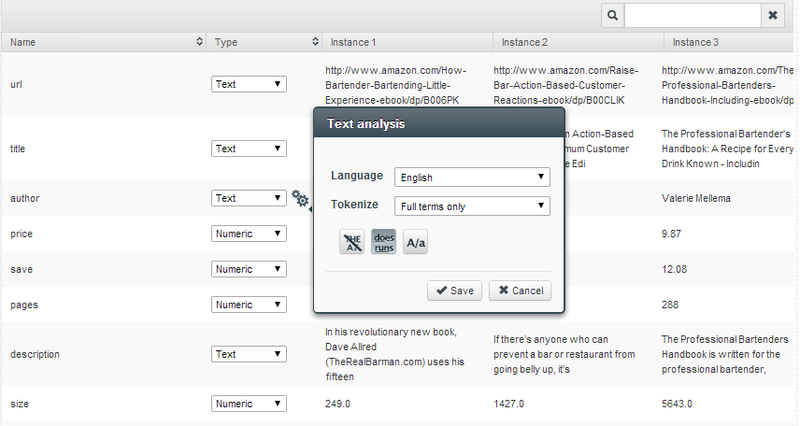 This data source includes both text, numeric and categorical fields. To optimize the text processing for authors, I selected “Full Terms only” as I don’t think that first names would have any bearing on the results. In the above image we see generic book-oriented terms like “book,” “author,” “story” and the like coming up most frequently – but we also see terms like “American,” “secret,” and “relationship” which may end up influencing ratings. My typical approach is to build a model and see if there are any interesting patterns or findings. If there are, I’ll then go back and do a training/test split on my dataset so I can evaluate the strength of said model. For my model, I tried various iterations of the data (this is where BigML’s subscriptions are really handy!). I’ll spare you the gory details of my iterations, but for the final model I used the following fields: price, pages, description, lending, and number of reviews. You can clone the model into your own dashboard here. The highest predicted value is on the far right (zoomed below), where we predict 4.57 stars for a book that contains “god” in the description (but not “novel” or “mystery”), costs more than $3.45 and has lending enabled. 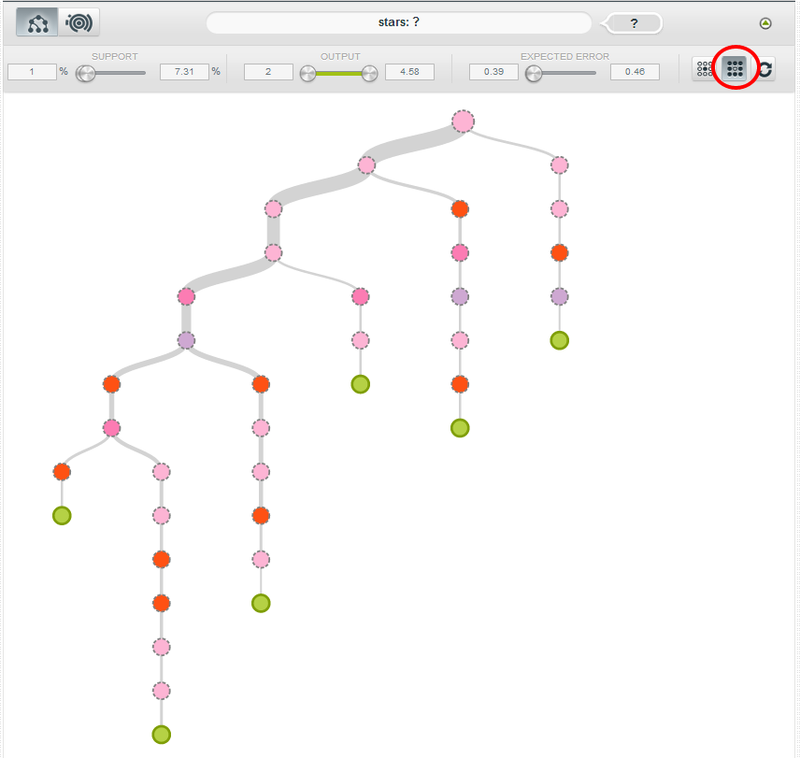 Looking through the rest of the tree, you can find other interesting splits on terms like “inspired” and “practical” as well as the number of pages that a book contains. Evaluating your model is an important step as data most certainly can lie (or mislead), so it is critical to test your model to see how strong it truly is. BigML makes this easy: with a single step I can create a training/test split (80/20), which will enable me to build a model with the same parameters from the training set, and then evaluate that against the 20% hold-out set. 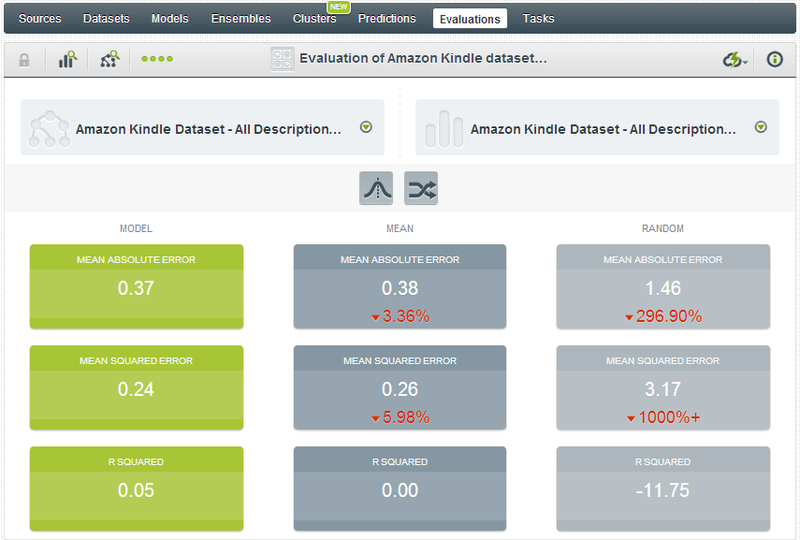 (You can read more about BigML’s approach to evaluations here). 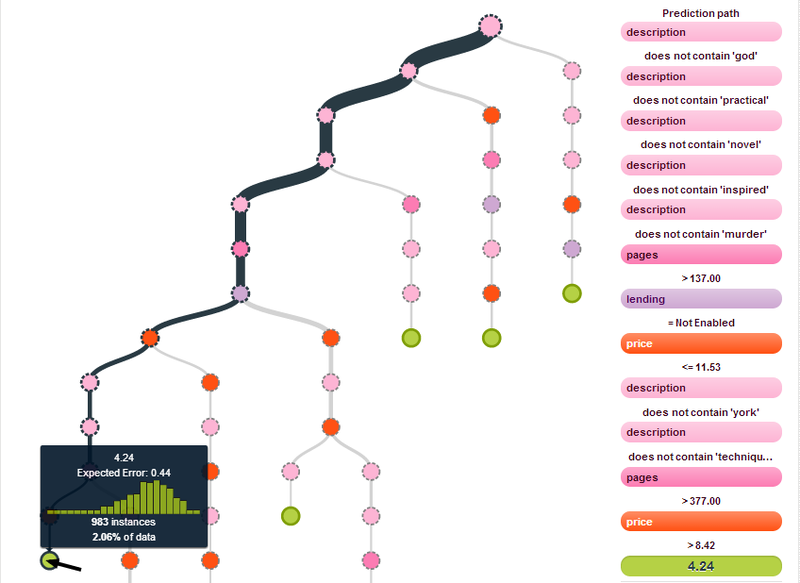 This was largely a fun exercise, but it demonstrates that machine learning and decision trees can be informative beyond the predictive models that they create. 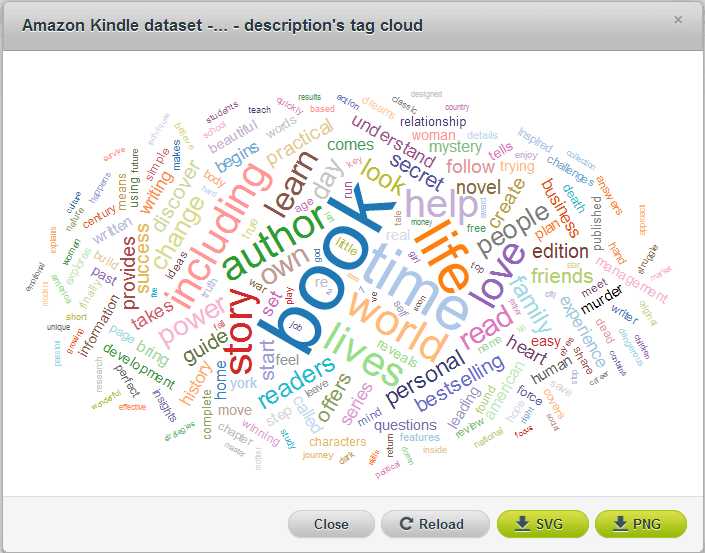 By simply mousing through the decision tree I was able to uncover a variety of insights on what datapoints lend themselves to positive or less positive Kindle book reviews. From a practical standpoint, a publisher could build a similar model and factor it into its decision-making before green-lighting a book. Of course my other takeaway is that if I want to write a highly-rated Kindle title on Amazon, it’s going to be have something to do with God and inspiration. PS – in case you didn’t catch the links in the post above, you can view and clone the original dataset, filtered dataset and model through BigML’s public gallery.